When we talk of dessert, I always want rich, creamy, delicious desserts to fulfil mind, body and soul. I am sure even you would like that. What I want and what I get are two different things. Last week I posted recipe of Rabri and today we will learn to make Shahi Tukda which uses Rabri as a main ingredient. 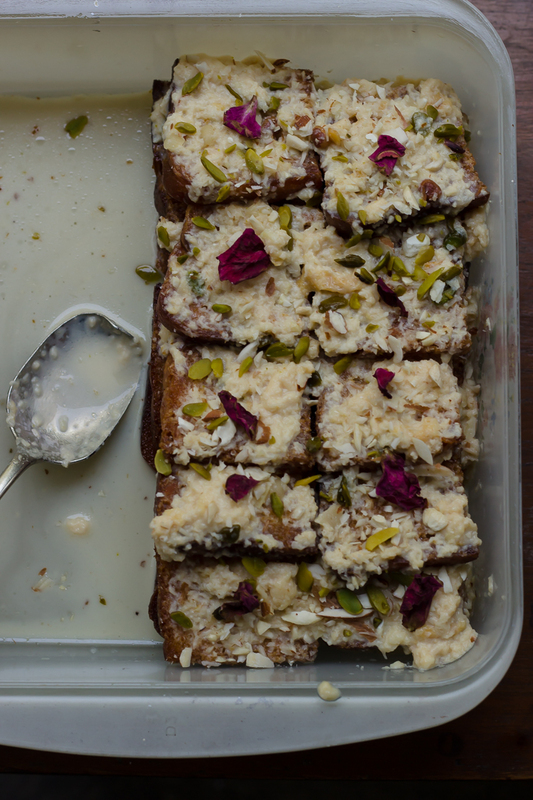 Shahi Tukda is a make ahead dessert, which doesn’t require much work but pleases the party with the royal flavour and presentation. As a child my mother made this often at home using leftover syrup of gulab jamuns, sans the rabri. I found the Rabri version too hard to resist and I couldn’t stop eating. Weight watchers, Beware!!! You can serve like my mother did without rabri for less guilty version. You can use a bread of any choice, I usually prefer going in for simple old time favourite, all-purpose flour basic bread, you can use whole wheat or multi-grain version as well. After deep frying the bread, you only need to sprinkle the syrup on bread and top with pre-made rabri. The taste is very rich, fulfilling, and equally amazing to look at. 1. Cut each bread slice into four pieces, and then deep fry the same. For the sugar syrup, mix sugar and milk in a thick bottom pan, allow it to cook for few minutes till the sugar dissolves and milk slightly thickens. 2. Place fried bread on a serving platter, and sprinkle sugar syrup on top of the slices. Allow them to soak the syrup slightly. Before serving, top the slices with liberal helping of rabri. Serve warm or chilled as per your choice. You can even serve Shahi Toast without rabri for a lighter version.